Christmas Day 2010 the Swift satellite observed a very strange gamma-ray burst in the distant universe. Gamma-ray bursts are extremely powerful bursts of radiation predominantly associated with massive stars that die in a violent supernova explosion, and researchers thought that they had a handle on the different types of gamma-ray bursts. The new gamma-ray burst was very different and now researchers, including members from the Niels Bohr Institute, have observed a new variant, which apparently ‘only’ produce thermal radiation. The results are published in the prestigious scientific journal, Nature. Here is illustrated the final phase of the model Christina Thöne et al. have proposed for the Christmas burst. The neutral star is seen in the centre and around it is the atmosphere of the star that collided with the neutron star. 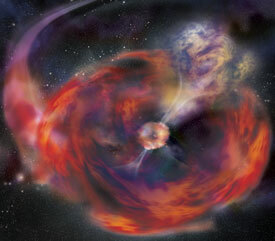 From close to the neutron star a two-sided jet is launched and the gamma-ray bursts is believed to be emitted from this jet (artist impression). Gamma-ray bursts are the most powerful explosions in the universe. They result from a stellar explosion where a portion of the stellar material collapses into a black hole, while the remainder is shot out into the universe. In the process, the dying star rotates very quickly and a disc of incidental material forms around the newly formed black hole. Perpendicular to the rotating disc of matter there is a compression of magnetic fields and when new matter is pulled towards the black hole, some of it is shot out into space as two powerful jets. The gamma-ray bursts are believed to come from these jets. These two jets are discharged in opposite directions at a rate approaching the speed of light. The gamma-ray outburst typically lasts only a few minutes. 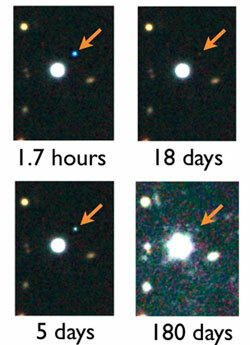 The gamma-ray burst that was observed on the 25th of December 2010 lasted more than half an hour. This is longer than most gamma-ray bursts previously observed and at the same time behaved very strangely. It was also impossible to measure the precise distance. This gave rise to several different explanations, for example, that it could be the case of a comet that had fallen into a neutron star in our own galaxy. “In our analysis we discovered that it had to be an entirely new kind of stellar death”, explains Christina Thöne, who received her PhD in 2008 from the Dark Centre at the Niels Bohr Institute at the University of Copenhagen and who was a guest researcher at the Niels Bohr International Academy this year. She led the research of the unknown type of gamma-ray burst with Antonio de Ugarte Postigo, who until September this year worked as a postdoc at the Dark Cosmology Centre They are both now affiliated with IAA in Granada, Spain. Gamma-ray bursts are detected by satellites, which transmit information about the position of the gamma-ray bursts to Earth where the afterglow is observed using a series of telescopes. The afterglow occurs when the jets hit the thin, interstellar material and gives rise to a glow of light, which is observed from X-ray to radio wavelengths. Sekvens af billeder fra 1.7 timer til ca. et halvt år efter gamma-glimtet. I det sidste billede fra 180 dage efter glimtet ses en svag kilde som Thöne m.fl. mener er værtsgalaksen for gammaglimtet. The first special feature of the afterglow was its very long duration gamma radiation, which lasted for more than half and hour. A series of observations quickly made it clear to the researchers that the afterglow was produced by two terminal sources, which in the language of physics, emit ‘blackbody’ radiation. While one of the sources had a stable temperature, the other grew and then cooled down. So the researchers worked out a model that could explain this phenomenon. “We think that we are dealing with a binary star system. Our model shows that it is a neutron star that is about to collide with its companion, which is an ordinary star late in its life and is burning helium in its core and is surrounded by a hydrogen rich atmosphere. When the neutron star slams into the atmosphere of the helium star a large portion of the atmosphere is cast out into space. Finally, the neutron star fuses with what remains of the helium star and forms a kind of gamma-ray burst. The interaction of the discharged jet from the explosion with the atmosphere of the former helium star causes this jet to slow down so that the radiation is no longer relativistic, that is to say, that the jet is no longer moving close to the speed of light. This is also called ‘thermalizing’ of the jet, i.e. that there was a uniform heat in the jet. What was observed was precisely this hot material – a mixture of jet and the discharged atmosphere. Eventually this leads to these unusual gamma-ray bursts as well as a weak supernova, just as astronomers measured, explains Christina Thöne. She points out that gamma-ray bursts can apparently originate from more processes and stellar explosions than previously thought. A gamma-ray burst like the ‘Christmas burst’ has not been observed before, perhaps because the thermal radiation can only be detected in relatively nearby gamma-ray bursts. And nearly 15 years after it was discovered that gamma-ray bursts come from cosmic explosions, new surprises still await us.